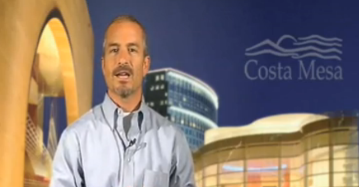 Interim Communications Director Bill Lobdell announced the creation of The Costa Mesa Minute - a brief, daily video presentation to be presented each weekday morning shortly after 8 a.m. I think these efforts are just one more excellent tool to communicate with the public and to respond to recent questions at council meetings in a very timely fashion. You'll find a link on the city web site. They might as well do an episode on how the sun came up today and take credit for it. It's amazing to me that the councilmen chose to fix their streets first rather the streets that really needed fixing. Repairing the streets in Mesa verde was like adding another coat of unnecessary wax on a showroom car. These guys make me sick. Then they host a celebration because they ordered city staff to make unnecessary repairs to their already pretty streets? These guys make me sick. What other city wastes tax dollars to do these hokey minute briefs? Hire unnecessary PR guys at $3,000 a week, soon to be TWO at $184,000 a year plus pension and generous benefits. $684,000 on an entire staff to assist in their illegal outsourcing scam? Yeah they're transparent alright. Transparently STUPID. Welcome to the Costa Mesa LLC, the most openly corrupt city in the nation since Bell. "Dan" we over in Mesa Verde appreciate the improvements. We waited long enough for this stuff, which by the way was planned years ago, before the current Council was in office. Ask Peter Nagavi. As far as "corruption" you must be one of the disgruntled out of town employees who's upset because Costa Mesa, like many other cities, are finally starting to prioritize the residents and saying no to outrageous pensions and fiscal policies which were driving out City down. We support our Council and thanks to these road improvements, so do many people in Mesa Verde. Great post Dan !! Feel better?? What an idiot. I live in Mesa Verde, and couldn't agree with Dan more. The whole process has been a joke. Guess who's street was first? That's right, non-elected councilman Mensinger. It's taken over 2 months, but after tearing things up for over a month and then doing nothing, they actually slurry sealed yesterday. Don't hurt yourselves patting each other on the back, guys. Add another pissed off upset Mesa Verde resident who agrees with Dan. I think the people who are accusing anybody who is against the Fab 4 council clowns as not being residents of Costa Messa are they themselves out of towners or maybe they are on the clowns payroll!! I have lived in Mesa Verde for over 20 years. There was nothing wrong with our streets and I feel the money could have been better used for my eastside friends. I'm not surprised that we got our streets re-done, it's just a publicity stunt to literally pat themselves on the back for getting their own neighborhood unnecessarily re-sealed first. Ever driven through the westside? Probably not. This council should be ashamed of themselves for this publicity stunt in an attempt to make themselves look good. Too late! Their lies about the financial state of the city and their $1,000 an hour in legal fees are outrageous. Nothing they do can ever undo the damage they've caused to our once great city. Shame on the councilmen. Mikey G here. Husky dog lover, Estancia football supporter and employee basher. I'm glad we got our streets done first. Get over it, it's one of many perks that come with being elected by 14,000 or in Steve's defense, being appointed my master piggy. I believe the street repairs in Mesa Verde were paid for out of Measure M funds, not the general fund. Measure M funds are required to be used for street repairs. These improvements were scheduled long before Piggy and Mensy were on the council. Having a party to celebrate the new road work is a bit much, considering that Piggy and Mensy had nothing to do with it, but want the credit anyway. I don't consider this transparency. Transparency means open government, open meetings, no "2-man ad hoc committees", listening to the citizens, being open about when where why and how the money is being spent. This is just fluff, simple public relations. The only thing transparent here is our council is corrupt and care nothing about this city or the residents, only about themselves and one little mans political dreams. Hookay already. I can find plenty of real reasons why this council majority should retire and start collecting their benefits tomorrow. But that’s another discussion. Looks like we can't blame them or give them credit for the street repair in Mesa Verde. A lot of my friends and neighbors had these same questions, so I called Peter Naghavi at City Hall and he patiently answered all my questions. The repairs are the result of Measure M grants to the City and the areas to be repaired were decided long before Steve or Jim were on the council -no influence and no city budget involved. He said about 80 streets on the East side are slated for repair next year from the same grant. Some of the Mesa Verde improvements were badly needed, but I am kind of puzzled about why certain streets were chosen, there are others in the City that seemed worse to me too. The people who deserve the credit are Mr. Naghavi and staff, who are superlative grant-writers. They have helped Costa Mesa get a lot of money that doesn't come from our city coffers. From our pockets yes, as taxpayers. But not from City money. My (unsolicited) advice to everybody – get the facts. Then get your head of steam up. Do you really think anyone believes anything we read on here? What's sad is, we residents are more likely to believe what Geoff West says than anyone from the city. That, friends, is how low the city's credibility has sunk. It doesn't matter who says what, the trust is gone. November 2012, please get here already! We love your blog Geoff! Keep up the good work and it is very entertaining to see all sides of the comments! I live in Mesa Verde and am glad they spent the money. Give it up out-of-town union people - the ride on the taxpayer gravy train is over. You had a nice run. Best now to demand some job assistance programs from your unions before they waste all your dues money on a losing cause. I live in a cardboard box behind Marukai Market. I will repeat talking points Das Riggmarshal tells me. I will go to council meeting and smirk when Smirkmarshal Mensinger texts my cue. Unions bad. They want good wage and conditions for workers. Me happy for 5 dollars an hour washing Riggmarshal's car. Riggmarshal and friends get rich, move back to Newport. Me get bigger box, hell with Costa Mesa. Why aren't the Unions celebrating all the people who got jobs with these new streets? Or, is it their jobs, union dues paying jobs they care about. Further translation, in November, voters will remember the structural budget changes, investment in infrastructure and poor behavior by Unions. Now, and soon more, we are seeing other Cities face the same reality that Costa Mesa faced. That’s why it has been news. All public works construction jobs pay prevailing wage which is essentially union wages. I know you think Piggy is the next messiah, but at least get your facts straight before you post. Piggy had nothing to do with the street job in Mesa Verde. This project was on the schedule long before he came on the council and was paid for my Measure M funds, not general fund. American Asphalt is a union shop. Roeder had these pots of money buried. Current Council prioritized and accelerated the investment in infrastructure. Let's just say you were right. Residents don't care. They are just excited to see their streets fixed. Honestly , I hope the CM unions continue to believe their forced PR. "Roeder had these pots of money buried." Union bad. Roeder bad. Man who care about city, have good reserve bad. Man who make up crisis like Riggmarshal good. "Current Council prioritized and accelerated the investment in infrastructure." Current council get street paved fast before all money go to lawyers to defend current council bad behavior and law breaking. "Residents don't care. They are just excited to see their streets fixed." Resident get excited, have more fun when many less police like Riggmarshal make. More fireworks. More guns in yard. More break into store and home not get in trouble. "Talk to any real estate agent what it is like showing homes with new streets." Riggmarshal buddy Fisler happy. He hate Torelli anyway, want to compete. You would think by now I wouldn't be surprised after reading a "post" here; then going on to read comments, they are not germane to that post. I have no problem with Dane’s 4 minute “Costa Mesa Minute”; honestly, I’m glad the guy still has a job. It doesn’t really matter that the stories are exactly what you can read in the weekly “Hatch Dispatch”; Dane is just so darn cute. … I’m curious how this post turned into a “bash the street paving”? Also, will we be seeing Rig/Mess doing the “Minute” when the A/V department is turned over to the lowest bidder? This could be part of the low bidder’s contract; they could stroke the egos of these guys and get a “Twofer”. We could call it “Rigged Messy Minute”; or “Rigsta Messa Minute”; how about “A Menacing Minute”; “Charlatan’s Miserable Minute”? Not surprising that Oc longhair uses any topic to bash council. No value to.discussion. Need a haircut... it's covering your eyes. I was ON topic... street paving was NOT the post's topic. After trimming you bangs, view my initial comment. I never bashed anyone. I only made positive suggestions and complemented Dane... you don't think he's a good looking TV talent? We’ve been told that A/V is more than likely going to be outsourced. I was only trying to help; give suggestions. Yet again we must tolerate those imbeciles who jump around, posting under whatever URL they choose; most of the time with a lame attempt at humor. So hide in the shadows, post under your many aliases… with an IQ nearing 90, we await your next deeply philosophical and no doubt, insightful blither. Joe, I just bought a 60" LED. If you would like the box it came in for a room additon I would be glad to give it to you. It's flammable so you would have to lay off whatever it is you are smoking when you are in it.